For those who've been following my artistic journey, you'll know how big a deal this is to me personally. A little over two years ago, I started doing something which I hadn't done for over a decade - I picked up a pen and started drawing again. Inspired by a chance encounter with Dan, the founder of creative company Scriberia and Jenny, a regular at the Gentlemen Baristas coffee shop. This exhibition is the culmination of over two years of dedicated self-taught work; mostly done within London coffee shops. 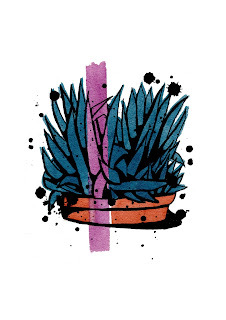 From learning basic techniques to understanding paper types for producing high quality digital prints. I'm incredibly excited and nervous to finally exhibit my work thanks to Matt and Rachel - the owners of Craving Coffee. For those of who don't know, Craving Coffee offer their coffee shop completely for free to emerging artists on a monthly basis. I can't thank them enough for this opportunity. 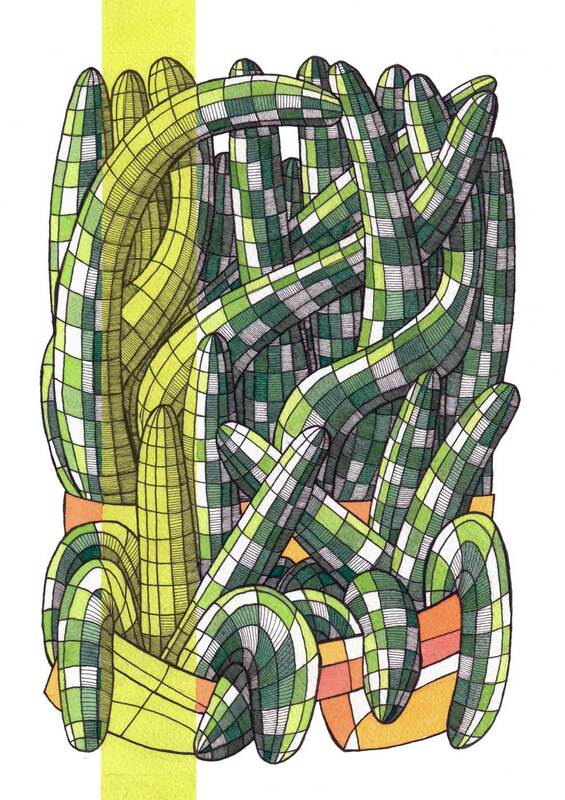 You can buy custom limited edition prints from my Etsy shop. I'd love to see many of you there as possible - Craving Coffee throw amazing launch parties for their artists (and I'm also taking the opportunity to celebrate my 30th birthday). My next series will be much more befitting for this blog, I'll be painting 10 different London coffee shop storefronts - so do keep an eye out! Bring on the Coffee and …. Bourbon? Anyone who’s ever met Ed and Henry, the dapperly dressed minds behind the Gentlemen Baristas on Union Street, know they’re not one for the ordinary. Rumours were flying when their shop near London Bridge suddenly was well-stocked with a plentiful supply of Bulleit Bourbon. Many of us wrote it off as just their personal supply. Running a new coffee shop is hard work and no one would hold a propensity to wind down with whiskey against them. Turns out, as some of us discovered yesterday, they weren’t just drinking it, they were up to something far more interesting too. The GBs and Bulleit Bourbon have partnered to produce two limited edition coffee varieties which have been rested in Bulleit Bourbon casks for 14 days. One filter “The Gatbsy” from Colombia and another Espresso “The Trucker” from El Salvador. Roasted by the legendary Dumo Mathema of The Roastery Department Fame, the Colombian filter I had was pretty incredible. We tried both the filter without the bourbon-cask finish and with it. Dumo has still managed to keep the delicacy needed for a filter, the difference is in the finish, with the Bourbon providing a refreshing spice. I was pleasantly surprised by the taste, it’s a filter I would happily have again and would love to see this used as a guest in some coffee shops. It was also great to see filter used to form the base of a cocktail. Bulleit brand ambassador Andrea also served an incredibly smooth cocktail using the filter as a base, adding in Bulleit whiskey, roasted coconut and a variety of spices. How did speciality coffee come to this? Speak to anyone in London about the industry and it’s only a few minutes before the subject of “pods” somehow makes it into the conversation. It’s the literal invasion of the pod people. For those unfamiliar, think Nespresso. The technical term for them is a “single-serve coffee container.” It’s somewhat confusing as the term “pod” now generally refers to “coffee capsules,” the aluminium or plastic package encompassing ground coffee. The Nespresso System was invented in 1976, quite some time ago, but it was to be another decade before it would actually start to sell. But, speciality coffee is trying to strike back, spurred on by Nespresso’s patent expiring in 2012. I have heard of no less than six groups of people within the industry trying to develop their own line of pods. The two which have gone public, and of which I’ve had the opportunity to try, have been Pact Coffee’s new “Pact Pods” and the World Barista Champion Maxwell Colonna Smalls “Capsules”. 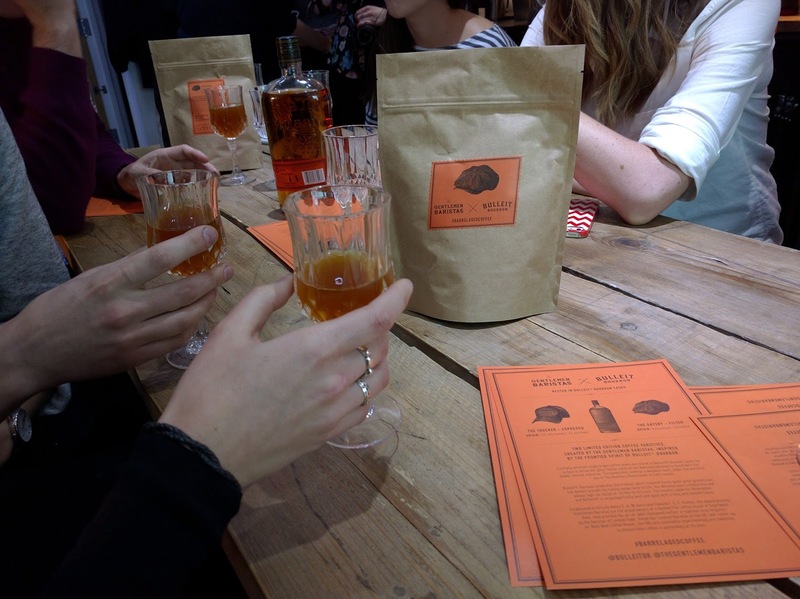 Mexwell speaks to specialty coffee pundits about pods at an event hosted by Assembly Coffee. I’m not going to go into too much detail about the pros and cons of pods. I’m sure there’s going to be no shortage of coverage from far better coffee pundits. Rather, I’m just going to tell you what I think about pods. It might surprise you, but I don’t actually find them that bad. I think about the Daniel from seven years ago, the one who knew little about speciality coffee, but everything about falling for marketing gimmicks from retail coffee brands. If he had the opportunity to not only buy Grade 1 coffee, but also have a fool proof way of making it at home, surely that’s a good thing? At least as a way to get him further into speciality coffee. I don’t buy everything from the pod-enthusiasts. I think there’s a lot of rubbish. The idea that restaurants could embrace pods is a bit hard to swallow. They’re terrible for the environment. They’re also a bit of a rip-off and there’s a question about how ethical their mark-ups are on farmers. In the end, when speciality pods do emerge with a force I wouldn’t personally buy them, but I’m not going to sneer at those who do either. 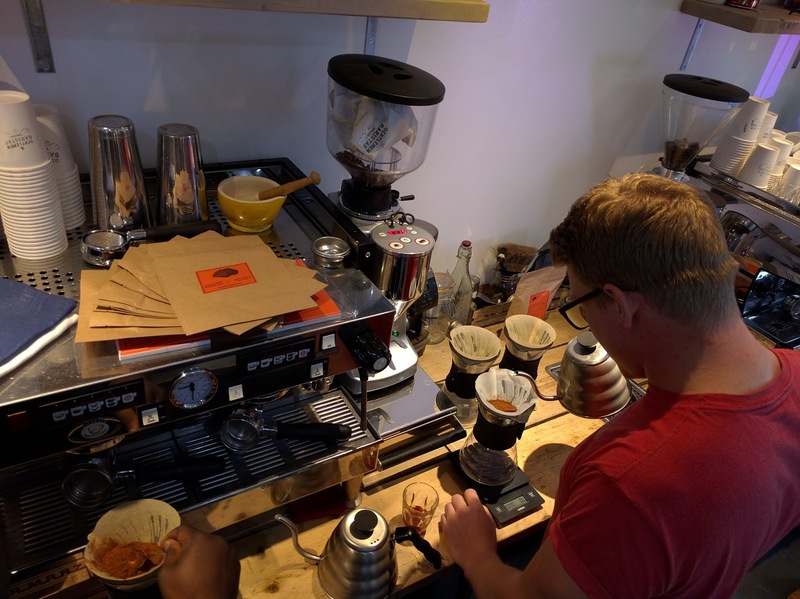 What is the State of Speciality Coffee in London? A month ago, James Hoffman wrote a three-part thought piece detailing the state of speciality coffee globally using London as a case study. It’s definitely worth a read. In it, he pointed to the positive outlook in the industry and warned that the current rate of growth the market was likely set to experience a market correction. Whilst agreeing with some of the assumptions, I disagreed slightly with some of the conclusions. By popular demand from many of those in the industry, the following is a modified version of my response to Hoffman’s article. I believe the bubble you've described is beginning to form in London. I have mentioned it briefly to a few people in the industry that there will be natural saturation point. You covered these points in the Lull and Bubble excellently. However, it may be a while before this happens and I anticipate we will see (and already have seen) a change in business models as coffee shops adapt to new trends. Of the 330 coffee shops I put on my map a year ago, I estimate only 20 - 30 have closed. There is still quite a bit of growth potential. We might see what you've described in particular areas of London first though. I can think of a few places where I believe the market is at capacity. 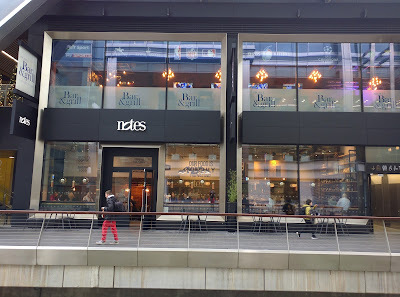 Within London, coffee shops that are opening are, as you mentioned, not innovative. Most new entries (those who are new to the industry as a whole) are, as you highlighted, those office workers/career changers who've been attracted to the growth of the industry. Usually these individuals will have an espresso blend and machine supplied from one of the main London roasteries. These rarely have filter options and the quality is largely dependent on which roastery they go with and the subsequent training they receive. The other category are those baristas who have realized after 3-4 years that the only way to progress in the industry is to open your own place. 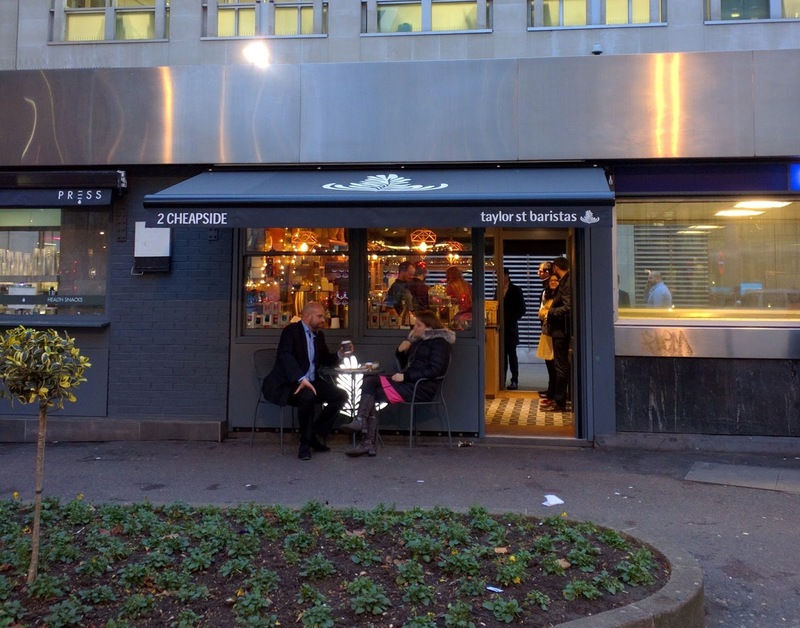 First, coffee shops in London that have operated for 1-2 years have been immensely successful and owners are looking to open their second or even third site. Most coffee shop owners that I know are looking to expand and/or begin roasting their own coffee. Second, we are witnessing the growth of "independent chains." 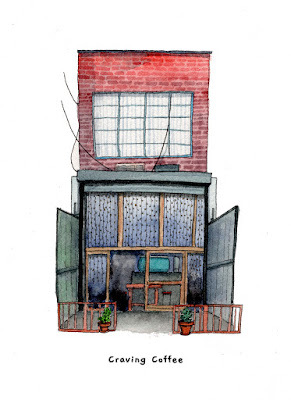 Notes/Grind/Taylor Street/Fernandez and Wells/Beany Green/Dept of Coffee all have ambitious expansion plans. Both Grind and Beany Green raised bonds of over £1m to fund new sites. Third, big London institutions (like the National Opera, the Tate, etc.) and public institutions (churches, libraries) are retrofitting their outlets to take into account of the growth of specialty coffee. Big chains (Pret, Starbucks) are either changing their language or launching their own concept stores. There is now the direct establishment of specialty coffee stalls within offices. All of this supports your analysis. However, something important I think you've missed out within your analysis is the consumer. To give an example, of the 400+ coffee shops that I've visited and are still trading, I estimate only around 80 offer filter coffee as an option. I think for many, filter is seen as a bit of novelty or even an annoyance- particularly during rush hour, that offers terrible financial returns. I have sat in coffee shops during rush hour and seen baristas dissuade customers from ordering filter and suggesting a long black instead. Some coffee shops with high trade have tried to circumvent this by offering batch brew instead. It’s not difficult to see why, overwhelmingly flat whites and lattes are what customers order. I am going to go out on a limb and suggest this: specialty coffee is not growing. Coffee shop culture is growing instead. This is partially due to urban trends (Cities are growing. Suburbia is not. ), the role of cafes as replacing traditional community hubs (such as the pub) and the rise of the experiential economy. There is now a research study of the University of Coventry looking at the role of coffee shops in urban environments. The role of cities has changed dramatically. Coffee shops are unwittingly part of a wider trend. Coffee shops have already adapted their business models. Timberyard is not purely a specialty coffee shop. Timberyard is a co-working space for London's growing tech/creative sector with specialty coffee. The Grind group is a brunch/cocktail bar with specialty coffee. Beany Green is catering to the huge rush of office workers with a compelling takeaway lunch menu. Association Coffee/Workshop are catering to office workers who need high-end and affordable meeting spaces. In outer London, there is an entire new market of "play cafes" catering to the market of women with young children that serve specialty coffee. So where can Specialty Coffee go from here? In the past, coffee-producing countries collaborated and collectively pumped millions into advertising, research and PR to grow their customer base. They knew they all benefited from working together to increase the size of the market. If the market for specialty coffee is to become saturated, than another solution is to try and increase the market. As you pointed out, in the UK- per capita consumption has barely grown and the UK remains one of the only countries where instant coffee is favored to fresh ground of fresh coffee beans. There is still massive scope to covert people to specialty coffee. 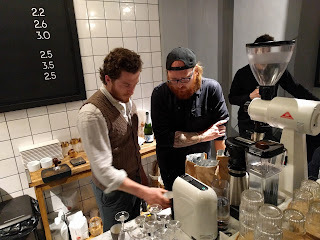 This was one of my first observations about the UK coffee scene. There is no collective voice that reaches out to try and engage customers. Coffee classes are ridiculously expensive (one coffee shop has an "introduction" that costs £160.) and cuppings and events that are currently being held I find inaccessible to the average consumer. Caffeine Magazine is a welcome step for the UK as is the introduction of sites like Perfect Daily Grind, but there needs to be something even a bit simpler. I think there is room for an organisation to collectively band the independent coffee industry together through subscription/membership fees with the sole aim of promoting and training the next generation of consumers to appreciate good and better coffee. Publishing free coffee introductory guides to be stocked in independent coffee shops. Launching integrated social media campaigns (such as Kaffeine's #SaturdayCoffee), encouraging coffee shops to hold free cuppings on specific days (they really should be called coffee tasting) and free training courses. Holding events with a greater focus on consumers and a greater focus on coffee shops and coffee culture in London. Recognizing that unless more people are converted into specialty coffee, then the industry itself might become just another trend. The Penny: Unless you were looking for it or happened to glance at the small chalkboard outside, odds are you would have waked straight past the Penny. 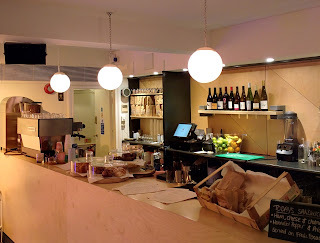 Tucked in the basement of the much less conspicuous Old Vic Theatre in Waterloo, is the theatre’s newly refurbished café. Designed by the same teams behind M1lk and Fields Café, the Penny provides spacious seating in a minimalist but homely environment. The Penny is part of a wider trend of public institutions retrofitting their outlets to account for the growth of specialty coffee. The coffee is from Workshop with a selection of lunch and dinner options. The Coffee Traveller: One of London’s best success stories is behind this wonderful new opening in Chiswick. Neil Vanstone has been diligently serving great coffee from a refurbished truck at Brentford Market for over 2 years. Now he finally has a permanent fixture. Like Bogota Coffee in Milton Keynes, Neil has rejected the stereotypical minimalist design, and gone for a café with Central American inspirations. The centerpiece has to be the purpose-built shack in the center of the store with a service counter at the front and a brew bar at the back. The coffee is from Caravan with a range of brew options available, including syphon. 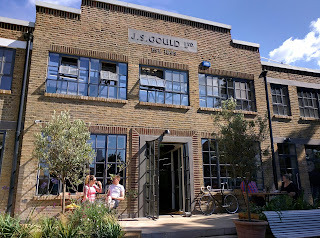 Possibly one of the most underrated and best cafes in London at the moment. Association Coffee: The second Association Coffee outside the City Thameslink simply opened one day with little fanfare. In fact, Association hasn’t even updated its website or social media with its address, all that confirms its existence is five tweets from a twitter account. 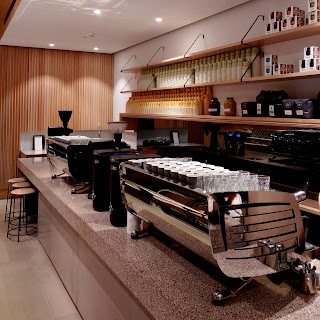 Association’s new shop is beautiful with a long counter that sports possibly the biggest concentration of specialty coffee tech in London with not one, but two black eagle espresso machines. Association offers a range of rotating guest filters, when I visited they had at least three on offer. For anyone who’s passionate about coffee, Association is definitely worth a visit. Espresso by K2: Espresso by K2 opened in October in an area notoriously sparse in specialty coffee. 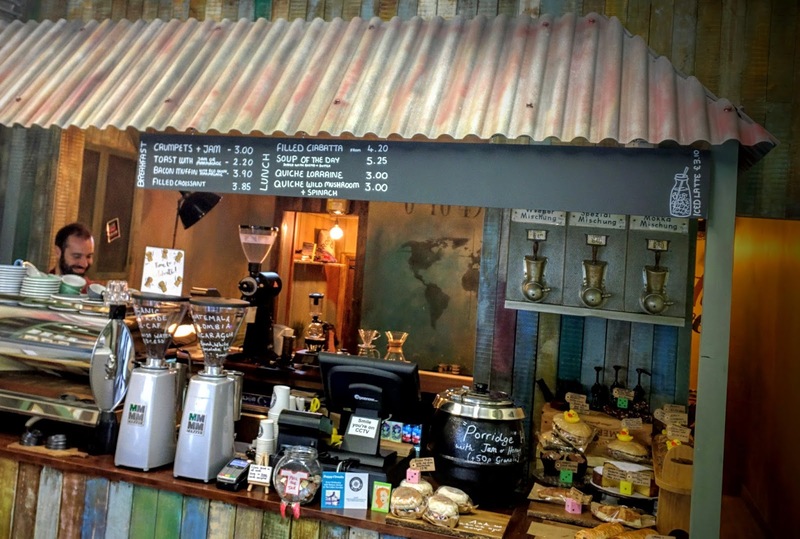 Located just off Parsons Green, K2 is a wonderful little antipodean café collocated within a tech recruitment agency serving coffee from the Roasting Party. It’s a one-man band set up with owner and barista Ricky who’s undoubtedly passionate about coffee. The high rise ceiling, open space, large marble counter and lighting all contribute to the atmosphere of this expertly designed compact café. 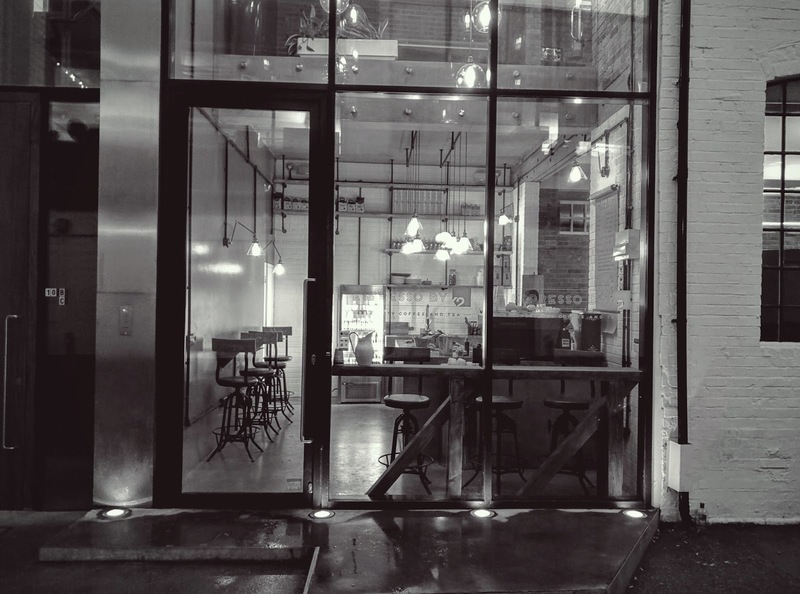 China Plate Espresso: One of the most exciting initiatives of 2015 was the arrival of Assembly, a collective of some of the leading figures in London’s coffee scene. 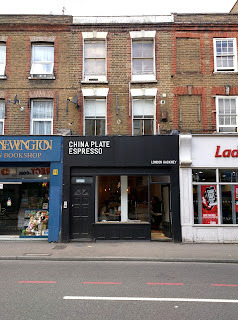 If Assembly had a flagship café, it would be the newly opened China Plate Espresso in Stoke Newington High Street. Self-described as “fourth-wave,” China Plate Espresso, places a huge focus on the quality of its coffee, serving a range of single origin coffees from a rotating guest roaster as well as Assembly roasted coffee and coffee from Dark Arts in Hackney. 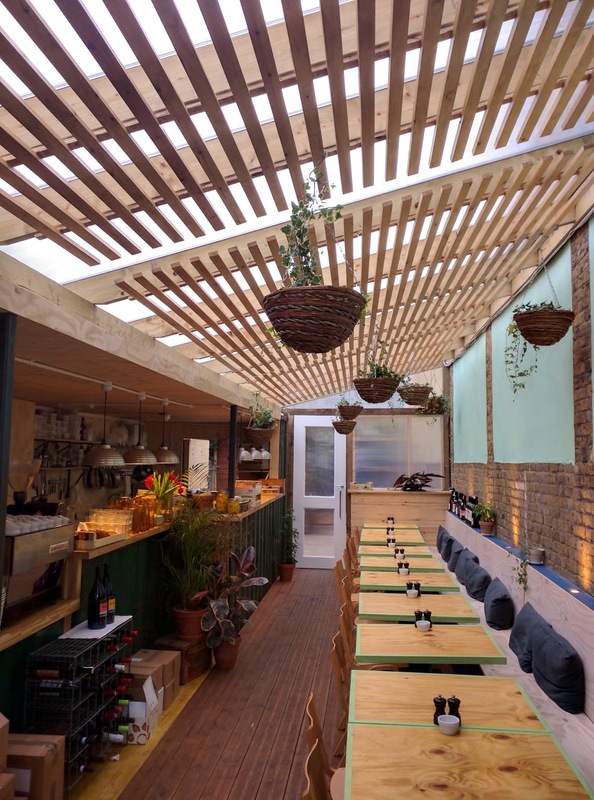 Dandy Cafe: Dandy Cafe is the latest opening in this list, tucked between industrial units in London Fields within a refurbished shipping container. 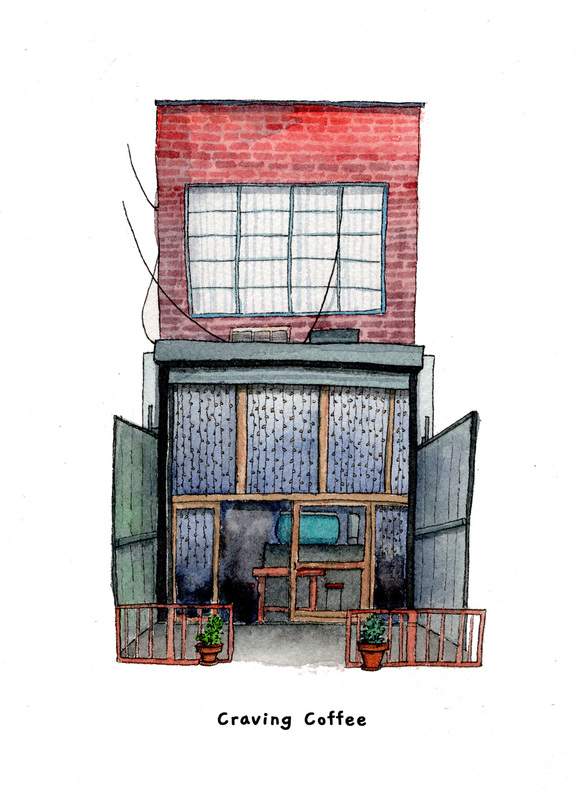 All parts of its design reinforce its ambition to be communal, warm and homely. It places emphasis on simple food with high quality ingredients. You won’t find any complicated menu items here. The coffee is from Square Mile with a rotating guest roaster and complimented by a great selection of natural wines and craft beers. I must admit, I had the best dish of my life at Dandy Café which was simply described as “creamed corn and poached egg.” I fully intend to visit it as often as I can before the queues begin to form. Origin Coffee: Cornwall-based roasters Origin had already built a reputation for the quality of their coffee. That’s why many in the specialty coffee scene were excited when they announced plans to expand in the capital, finally opening their flagship store in May. 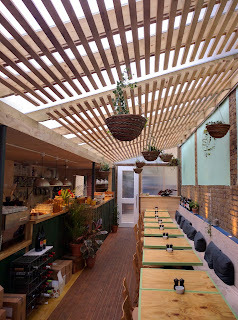 Located on Charlotte Road, it serves as both a coffee shop and a base for their growing wholesale operations in London (Origin recently began supplying the Soho House group). 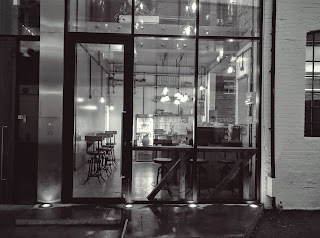 Their shop is beautiful and expertly designed with a lovely little brew bar showcasing a rotating selection of coffees. Allpress Dalston: Allpress are one of the giants of the London coffee scene, distributing their beans to over 180 coffee shops in the UK. Their second site, a delicately and beautiful refurbished joiner’s factory in Dalston, was the product of years of planning. The ground floor is split into two. One side taken by a custom-built hot air 70kg roaster, the ART MK3. The other by a coffee counter, café and open plan kitchen. It is breath-taking. I only have praise for Allpress, both for their coffee and for the service they provide to the cafes they source to. 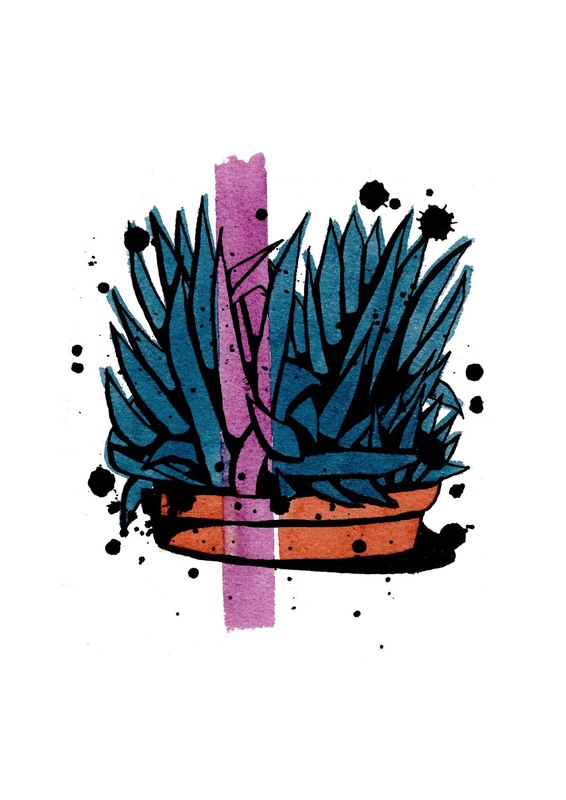 If there was to be one opening that defined the 2015, Allpress Dalston would be it. 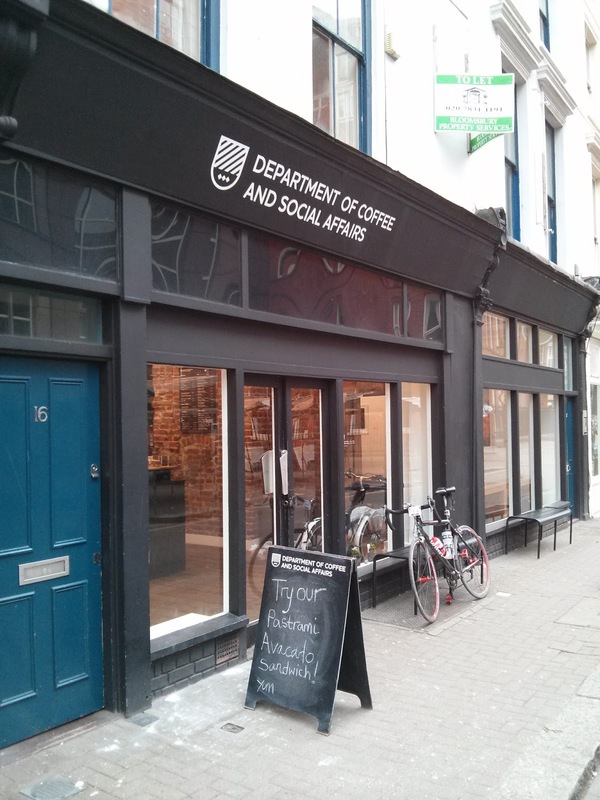 The Department of Coffee and Social Affairs first café opened in Leather Lane in 2010 and has since slowly expanded across Central London. In a shakeup, its rebranded all of its outlets under the original Department theme (although their shops still retain their unique styles). 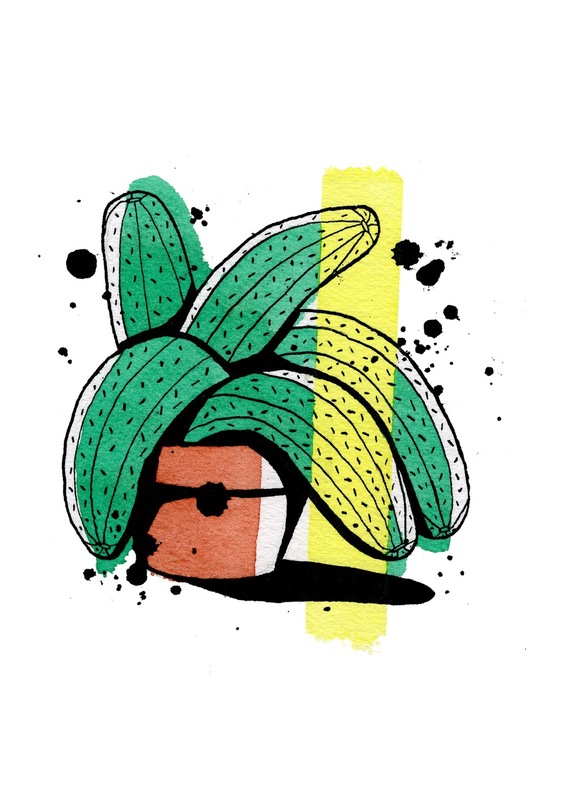 It’s invested heavily in its business recently, switching from using coffee roasted by the Tate, to roasting their own by talented head roaster Dumo Mathema. The story of Taylor St is more well known. It was founded by three siblings in 2006 and has since gone on to 8 locations (although it recently closed its Brighton branch to focus on operations in London). In 2012, it launched a partnership with Tesco to form Harris + Hoole which has around 10 locations in London (four centrally). Taylor Street wants to expand its operation in the capital, raising over £1.8 million in January to “double the size of its business” over the next two years. Like Department and Notes, Taylor St has started roasting its own coffee as well. 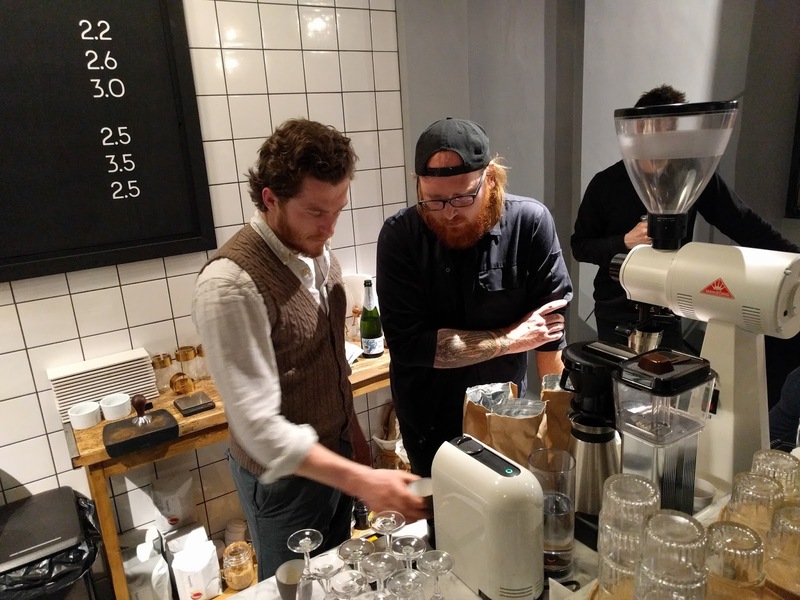 What does this tell us about the state of the London Coffee scene? The larger coffee shops are looking to expand and there doesn’t seem to be any shortage of capital. Four coffee shops have collectively raised almost £6m in expansion capital in less than 12 months. Beany Green, Notes and London Grind have all raised almost £1m each and Taylor St has raised £1.8m. One does wonder about James Hoffman’s worry and predictions about a bubble. That said, collective market share pales in comparison to the number of real chains. In 2014, there were 246 Starbucks in London, mostly in affluent areas with 119 in Zone one, mostly. Looking at where the big three are located, it’s a fair assessment to suggest they are targeting the same audience and might be chipping away at their customer base. 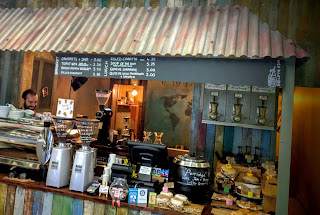 The successful business models these shops operate are complex and speciality coffee is sometimes only a small factor. 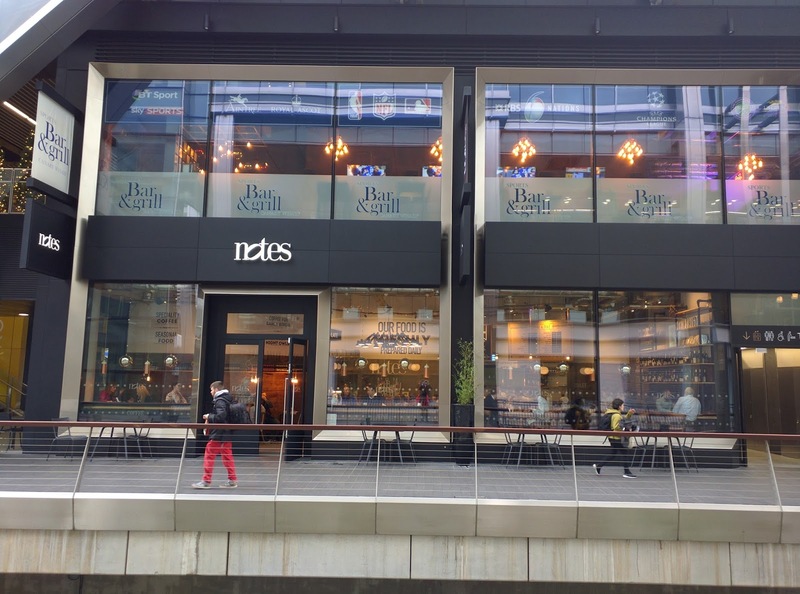 Notes is well known for its selection of wines and switches operations in the evening (similarly Fernandez and Wells). Taylor St is building customers through extremely competitive loyalty cards and is based in areas with a high office density. 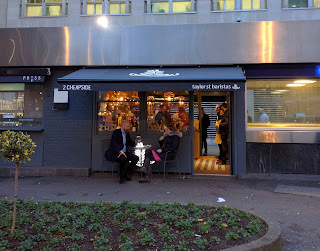 London Grind’s venues all double as cocktail bars, likewise with some of Beany Green’s. For all location is key, with white collar office workers being the target market, often for those who look to schedule external meetings. Larger coffee shops are developing control of their own supply chain by switching to roasting their own coffee in a bid to control quality and reduce costs. This is part of a wider trend in London of successful speciality coffee shops wanting to roast their own coffee, but the investments being made and scale of the operation by larger shops is discernibly greater. 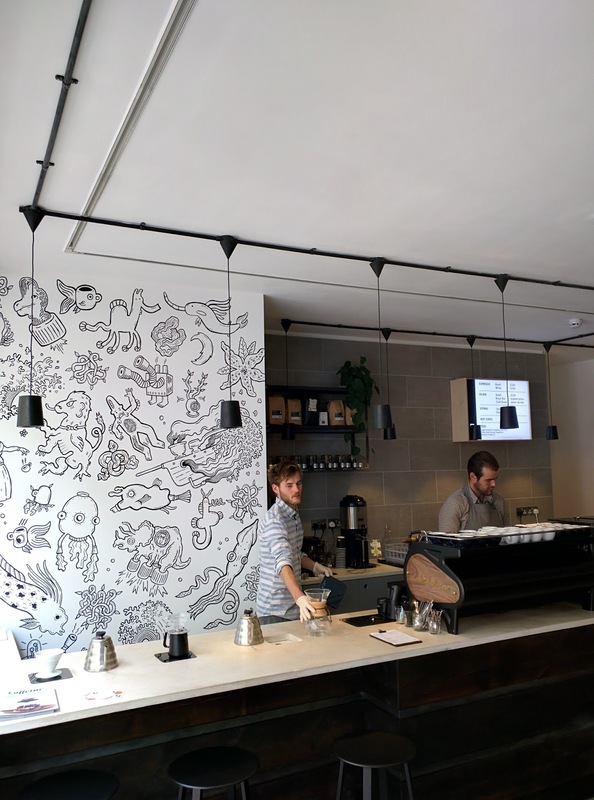 The other takeaway is that the speciality coffee shop as we often stereotype it, minimalist, antipodean and with a focus purely on coffee, is not expanding rapidly. Many of the coffee shops listed here only offer espresso-based drinks. This supports a hypothesis I have about the London coffee scene, the market for speciality coffee is not growing relatively quick- the market towards the higher end of café culture is. How their expansion will impact on the speciality coffee scene we’re still yet to see, but regardless- London is set to see the scene only continue to grow in 2016. Some of you may have noted a few changes to the site's coffee map. Hopefully these changes will make it easier to use and more useful moving forward. The first major change is that Google has finally made it that custom maps can be viewed on mobile devices. If you have Google Maps for Android installed, check out the map using this link. The second major change is that I've finally gotten round to updating the map. On Friday, I verified that all the coffee shops (all 330) that were on the map were still trading. Around 20 weren't, which is a lot less than I initially expected and might reflect that the London coffee scene is only set to expand further. I then added around 50 new coffee spots to the map bringing the total to around 350 - 360. The third major change is that I've added opening hours. The map already featured addresses and websites for all the coffee shops on it, but I thought this would be extra helpful given that weekend hours can be unpredictable (and in fact, some coffee shops are closed on Mondays and Tuesdays). The last change, and perhaps the most controversial, is that I've added a new symbol on the map to discern some coffee shops. I'll write more about why I've made these changes in the future, but the gist of it is: with so many coffee shops on the map, I felt there needed to be something to separate those coffee shops that simply served a single-type of espresso and those that really focused on coffee and provided additional brewing methods and had a wider selection of coffee available.